CactusVPN provides users with a secure, reliable connection and can unblock several popular streaming services. It allows P2P and should work in China. Since 2011, Moldova-based CactusVPN has kept its network to a very small scale. Nonetheless, it appears to have a lot to offer in terms of providing a secure and reliable connection. We’ve been trying the service to see if it’s worth considering for the average user. To help you decide if it’s right for you, in this review, you can find out about pricing, performance, security, privacy, customer support, and more. The server selection you have access to will depend on which CactusVPN plan you go with, but for the full VPN plan, there are 23 servers in 14 countries. You can connect up to five devices at a time, with mobile apps available for iOS and Android and desktop clients for Windows and MacOS. There are also apps for Amazon Fire TV and Android TV. CactusVPN offers a few different plans, and depending on your needs, you may be able to save yourself a couple of bucks each month. If all you’re looking for is access to US VPN servers, then the US VPN plan may be all you need. For $4.99 per month, you simply get access to four VPN servers located in the US. This may be suitable if you’re located in the US and just want to secure your connection, or if you’re outside the US and want to access geo-restricted sites. However, none of the server options allow P2P. A similar package at the same price gives you access to four UK servers instead of US ones. Reader Discount: Comparitech readers can get 14% off a three-month plan and 35% off an annual plan. The next plan, the one we’ve been testing, is VPN + Smart DNS. This gives you access to all servers (although there are only 23 of them), including some that allow P2P. You can also use the Smart DNS proxy, which can help you unblock geo-restricted content while maintaining your regular internet speed, but doesn’t help with privacy or security. This package costs $6.99 per month. The final plan actually includes no VPN at all and is just the Smart DNS by itself, the price being $4.99 per month. Discounts are granted to users signing up for longer terms. You can get 14% off a three-month plan and 35% off an annual term, bringing the cost of the VPN package to $17.99 (around $6 per month) and $54.99 (around $4.58 per month) respectively. If you want to buy a second plan, for example, if you need to cover more than five devices or want to gift someone a subscription, you can get 50% off the regular price. 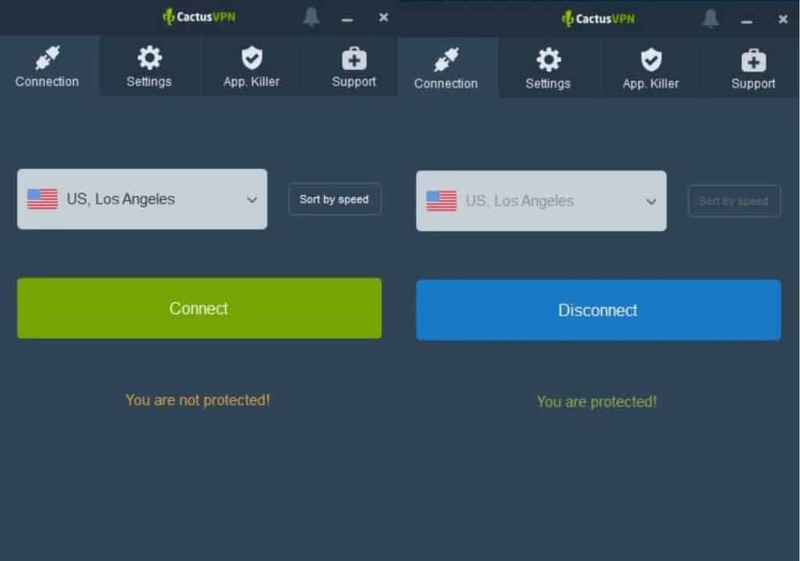 CactusVPN advertises a 30-day money-back guarantee, but only if the software doesn’t work, for example, you can’t connect to VPN servers or Smart DNS services. So this can’t really be used as a “try-before-you-buy” tactic. However, there is a 24-hour free trial available for which you don’t even have to hand over any payment information. You’ll have access to all servers and there’s no bandwidth restriction. Payment can be made using major credit cards, PayPal, bitcoin (and other cryptocurrencies), Qiwi, Webmoney, Alipay, and a few other methods. Bitcoin and altcoin acceptance is always welcome news to those looking for an extra layer of privacy. As mentioned, CactusVPN operates a network comprising just 23 servers in 14 countries. This is tiny, especially when you compare it to a provider like NordVPN with more than 5,000 servers or ExpressVPN which covers 94 countries. Most servers (14) are in Europe, with a handful in North America and a few in the Asia Pacific region. Servers are all physical and are leased rather than owned by the provider themselves, which is the most common setup in the industry. When you connect to a server, you will be assigned a shared static IP address. Sharing an IP address with other users adds another layer of protection as it makes it even more difficult to trace activity back to an individual. If you need a fast connection, you can sort the server list by speed in all apps. If you’re worried about the load on each server, this information is available within the client area server list when you log in to your CactusVPN account. We tested several servers to see how the connection performs while carrying out everyday tasks, such as streaming, browsing, and playing online games. On all servers, we were able to stream HD video with no buffering, as well as play online games with no noticeable issues. Server switching was quick and painless and the connection was reliable with no dropping. General browsing posed no problems and the connection speed didn’t appear to diminish. One more task we tested the servers on is downloading, which is how we gauge the server speed. We run tests that are designed to be as empirical as possible by repeating them at three different times during the day. We download a test file (165MB in size) while connected to each server, and repeat the test without a VPN as a control. The tests are run from Toronto and the same ones are performed for other VPN providers so we can make comparisons. The results are shown in the boxplot below. The median speed is the top line of the dark blue box. Lower is better. The box size can serve as a good indicator of how consistent speeds are. Smaller means more consistent. Hovering over each dot will show a popup that displays more information about that particular result. Here you can see that CactusVPN did pretty well, especially when we connected to a geographically close server in the US East. Some of those results were only very slightly slower than the control speed. When connected to geographically distant servers in the US West and the UK, as anticipated, there were more pronounced slowdowns, but still not much to be concerned about. The box size (representing the spread in results) is fairly small, which is a good sign that once you’ve been using the service for a while, you’ll know what you can expect from a speed perspective. Note that these results can only serve as an approximate indicator of what you might actually experience when using the service. The volatility of the internet adds a factor of randomness, so the tests should be taken with a grain of salt. They were run while using a 60Mbps connection, so you may see longer wait times with a slower connection, and potentially smaller or larger discrepancies. Does CactusVPN unblock Netflix and other popular streaming sites? Yes, CactusVPN works with Netflix and can unblock some other popular streaming sites. With US Netflix being the most popular library, that’s the one we typically test out first. Indeed, CactusVPN unblocked Netflix US with its Manassas server. It seems that this is the one that the company is focusing on because every other country we tried doesn’t work with Netflix. While this is not uncommon, it would be disappointing for users of the UK VPN package that only comes with UK servers, if Netflix access was something they were looking for. That being said, the UK servers do work with BBC iPlayer, which is notoriously hard to unblock. CactusVPN US servers unblocked Amazon Prime Video for us, but didn’t work with Hulu. Does CactusVPN work in China? Yes, CactusVPN should work in China, but it might be hit and miss. Even top-rated VPN providers have a tough time serving customers in the country, with the Great Firewall having been expanded to block VPN websites themselves. While VPNs aren’t illegal in China, their use is heavily restricted, and it can be difficult to even download and install your desired software. What’s more, the firewall is designed to detect and block VPN traffic, so providers need to use advanced cloaking (obfuscation) technologies to hide it. CactusVPN claims that their VPN service works in China for some users with the SoftEther protocol. Although, this protocol is not built into the app so you’ll need to install the SoftEther client separately. CactusVPN does provide tutorials for this, but with so many VPN websites being blocked in China, it would be prudent to download the apps and any relevant instructions before you travel to the country. CactusVPN is based in Moldova, which is not one of the Five Eyes or Fourteen Eyes countries. This is a good thing as Moldova citizens are not subject to mass government surveillance by other member states. Even though it’s a small provider, CactusVPN focuses heavily on providing users with a secure connection, and values the privacy of its customers as much as many of its top-rated, larger competitors. CactusVPN’s logging policy states that: “We do not store any IP addresses, traffic logs, connection timestamps, used bandwidth or session duration information that could be traced to a single person.” This implies that aggregate logs may be retained, but since nothing is linked to an individual user, there isn’t anything to be concerned about here. If the provider was ever asked to hand over information, for example to a government agency, there would be no link between the user’s identification and any connection history. As mentioned, CactusVPN doesn’t skimp on security. It uses “military-grade” 256-bit AES encryption along with SHA256 authentication, 2048-bit DHE-RSA key exchange, and perfect forward secrecy. It provides users with a multitude of protocol options to fit your needs: OpenVPN, L2TP/IPSec, IKEv2, SSTP, and PPTP. We recommend OpenVPN or IKEv2, but the latter is generally faster at connecting and better for mobile. PPTP is pretty much redundant now due to security vulnerabilities, but L2TP/IPSec and SSTP have their use cases. There are also tutorials for manually setting up CactusVPN with the SoftEther protocol; this is well-known for working in China and indeed, this is the protocol recommended for use in China by customer support. CactusVPN apps all come with DNS leak protection. It is disabled by default, but can be toggled on in the Settings screen. It uses private DNS servers so you don’t have to worry about Google or other third parties seeing your DNS requests. The service doesn’t provide protection against IPv6 or WebRTC leaks, and instead recommends that users disable IPv6 and WebRTC entirely. It does, however, offer users a kill switch in the desktop apps, which will kill the internet connection should the VPN connection drop for some reason. This is disabled by default but you can enable it in the Settings screen of the app. Simply find Stop internet traffic if VPN is dropped and toggle on. 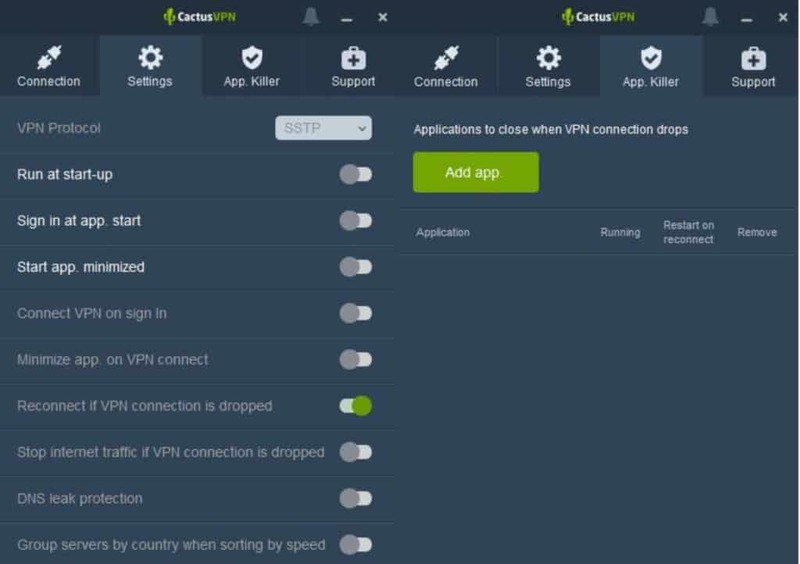 In addition to the main kill switch, there is an app-specific kill switch, the “App Killer,” which enables you to select specific apps to be closed if the VPN connection drops. To add apps, you’ll need to go into the App Killer screen to add the applications you want to be affected. This is intended for use when the kill switch is disabled and is a handy feature if you just want to protect specific apps, for example, for torrenting. 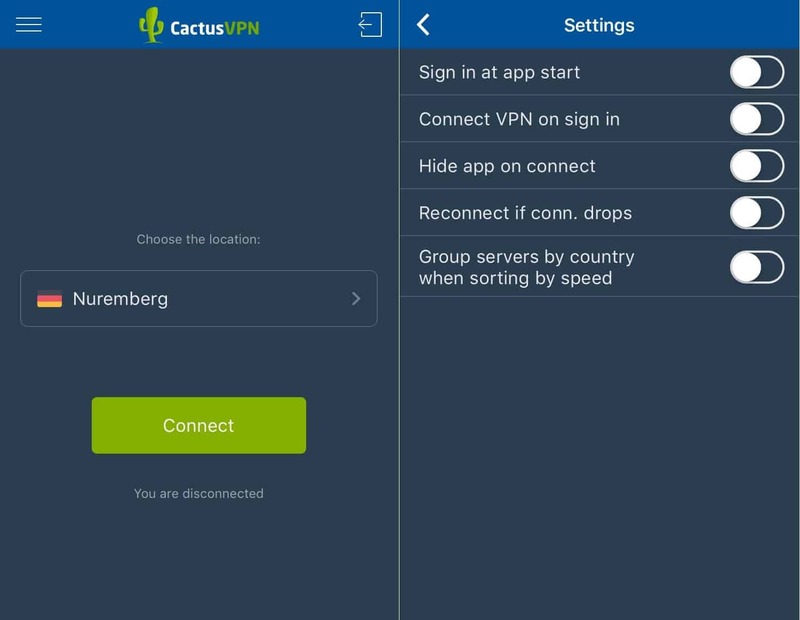 CactusVPN’s apps are very simple to set up and intuitive to use. Just download the appropriate app for your device and log in using the credentials provided. Note that you will receive separate login details for the VPN apps that are not the same as the username and password you use for the website client area. For the purposes of this review, we’ve been trying out the Windows and iOS apps. Once you’re logged in to the desktop app, the main screen will tell you that you’re not protected and display a server for you to connect to. To connect to the server shown, simply hit the Connect button. To choose a different server, go to the dropdown list. There aren’t many bells and whistles, for example, a search function or the option to view the list by city, but this makes sense with such a small list of servers. You can, however, sort the servers by speed, which is handy if you just want the fastest connection. Once you’ve connected to a server, you’ll see a blue Disconnect button on the main screen and you’ll no longer be able to access the server dropdown list. Over in the Settings tab, at the top, you have the option to switch VPN protocols. Note that this and many of the options below will appear grayed out and will be inaccessible while you are connected to a VPN server. Below that are several application startup options, followed by the kill switch (Stop internet traffic if VPN is dropped), DNS leak protection, and a server sorting option. The final tab of note is the App Killer which we discussed earlier. When you click Add app, you’ll be able to select any application installed on your computer that you’d like to kill in the event that the VPN connection drops. The main screen of the mobile app is very similar to that of the desktop version. You simply have the server location and whether or not you’re connected. Clicking the dropdown will enable you to select a server location and you can sort this list by speed if you wish. Settings can be accessed by clicking the menu (three lines) icon in the upper left-hand corner of the screen. The resulting screen is notably more sparse than the desktop app settings menu and is missing the protocol dropdown, a kill switch, and DNS leak protection. The app is very basic, which will be welcome news for beginners, but advanced users might be looking for additional features. If you require help while setting up or using the service, CactusVPN has several customer support options for you to choose from. The Support page on the website has setup tutorials, FAQs, and an option to submit a ticket, as well as some general information about VPNs. The FAQ section is fairly robust, although you may have to get in touch with CactusVPN for answers to more technical questions. Thankfully, their live chat customer support team is on hand to help 24/7. In our experience, the representatives were very friendly and knowledgeable about the product. The live chat is in-house instead of being outsourced, which is a big plus for privacy-conscious users. A couple of security questions had to be directed to the technical support team, for which we submitted a ticket. These were responded to within about five hours, which isn’t bad at all considering live chat is available. The response was concise and fully answered all of our questions without the need for a followup. It’s actually pretty rare to see such prompt and knowledgeable support from a smaller provider, so we were pleasantly surprised. CactusVPN’s major disadvantage compared to competitors, and the reason we wouldn’t be comfortable giving it a higher score, is its small server network. With servers in just 14 countries, this limits the possibilities for many users, especially expats from various countries seeking to unblock content from back home. There is also the fact that it doesn’t provide IPv6 and WebRTC leak protection, although there is a workaround if it’s a major concern. Overall, we’d recommend this service, but would advise checking the server list for your desired location first.